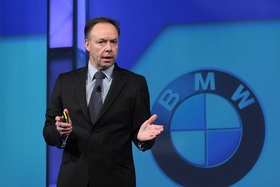 BMW Marketing Chief Ian Robertson: “Nobody knows which technology will have the most traction. If you don't have the full gambit, you won't satisfy regulations or customer desires." DETROIT -- BMW Group, traditionally a maker of high-performance luxury vehicles, is moving from that emphasis to embrace a greener future. Whether it is front-drive small cars, electric vehicles or diesels, BMW is looking at “sustainability as a key theme,” Ian Robertson, BMW Group's board member for marketing, said Wednesday at the 2011 Automotive News World Congress. Governments are more likely to force automakers' technological hands than consumer desires, he said. Robertson, 52, foresees electric vehicles representing 5 to 7 percent of the global vehicle mix. But if Chinese companies and research universities make a breakthrough in battery technology -- a nationwide technical agenda -- Beijing could trigger a massive shift in demand by mandating EV sales in China's congested metro markets, he said. “Nobody knows which technology will have the most traction. If you don't have the full gambit, you won't satisfy regulations or customer desires,” Robertson said. One segment Robertson dismissed is hydrogen power. Although BMW tested the hydrogen-powered 7 series a few years ago, Robertson said storage and infrastructure issues make hydrogen a doubtful technology. While automakers scramble for the alternative-fuels killer app, they also must make existing fleets more fuel-efficient. That is why BMW will introduce front-drive small cars in the near future. He added that BMW would produce numerous vehicles derived from its small-car architecture, code-named UKL.